24x30cm (approx 10"x12"), oil on canvas panel. The final in my quartet of pansy paintings, again with the casserole but painted larger and with a palette knife. Once again, unsure of the lid and I am debating whether or not it needs the pattern on the casserole. Also I am not sure of that dark background. C&C gratefully received. Hi Marion...I clicked on your badge at Leslie's blog and landed here! Isn't this fun? I think I have met you before on WetCanvas. 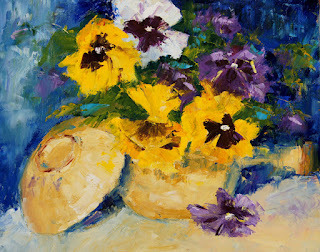 I love all these pansy paintings. Hi Meredith, Thanks for the compliment. Yes Leslie's blog is a good way to get out of the comfort zone. Some of her suggestions I have filed away for future thought, but they are all gems. I look forward to her daily suggestions every morning.